1. The Last Jedi, unlike its predecessor, has the freedom to be daring, and perhaps the most thrilling thing about it—and there are many, many thrilling things—is how abundantly it takes advantage of that freedom. If The Force Awakens was basically just Star Wars told again in a new, but familiar way, The Last Jedi challenges the audience, challenges the Star Wars mythos, even challenges the whole damned series itself. It blows the universe up to rebuild it; it is a continuation and a new beginning. And more than anything else, it goes places no Star Wars film has ever dreamed of going. The movie is smart, stirring and deeply exciting, but more than anything, it is surprising. This is a Star Wars movie that plays with your assumptions and upends them, but it never betrays the story, characters and ethos at the series’ core. It expands the idea of what a Star Wars movie can be. It’ll knock you over. 2. The movie opens with a breathtaking battle scene that quietly introduces all the themes the rest of the film will be interested in, notions of heroism, sacrifice and the intrinsic value of both, and neither. We see our old friend Poe Dameron (Oscar Isaac, magnetic as ever) sweeping in and out of a Starfighter battle with the First Order, and we cheer him on: Poe’s gonna save the day because that’s what Poe does, because that’s what always happens in Star Wars movies. But the movie has a lot more on its mind than that. We learn quickly that Poe’s dashing loner act actually costs lives – Leia demotes him immediately and even slaps him across the face—and the tone is set. Instantly we’re plunged into a story that is less about the good guys beating the bad guys and more about understanding what it means, exactly, to be good. This is a Star Wars story with moral complexity at every turn, a truly audacious decision from writer-director Rian Johnson that essentially turns the series inside out. It’s a film that makes us reexamine the morals and motivations of everyone onscreen, and of the entire series itself. It pushes us to make our own choices, to know what we’ve been cheering for this whole time. It is not simply Light vs. Dark, not in Johnson’s Star Wars universe. “There are no good guys or bad guys,” one character says. “There is just the machine.” The Last Jedi doesn’t believe that. But it makes us look closely enough at everything so that we can understand why. 3. Thus, when Rey (Daisy Ridley) heads off to meet Luke (Mark Hamill, giving a performance one suspects he himself didn’t quite consider him capable of), it is not simply a training session to go beat Kylo Ren and the Force Order. Luke spends his time trying to dissuade Rey from becoming a Jedi, or even the idea of being a Jedi in the first place; we learn more of Luke’s unknown weaknesses and strengths, including some he didn’t even understand himself. Finn runs off on a quest with a maintenance worker named Rose (Kelly Marie Tran, an actress of great empathy and warmth) that turns out to be more trouble than it’s worth until, suddenly, it isn’t. And Poe himself must learn, through clashes with both Leia and a new commander (Laura Dern) who has no patience with his grandstanding, that this new world is one where he must find his place in ways he never understood before. And even Kylo Ren, played by Adam Driver, a truly great actor finding poetry in Ren’s rage and confusion, must face who he is, what made him that way and how he can change the mistakes of the past … if he even wants to. The movie is chock-full of moments that put these characters, the new ones and the old ones, up for scrutiny: To truly look at what they believe, and the difference between evil and good, between black and white, between hope and fear. What’s remarkable is how it this complexity doesn’t darken our characters and the series we’ve loved for 40 years: It sharpens them. It makes them sing in a way they haven’t before. 4. This is a lot of discussion so far about things that don’t feature spaceships and lightsabers, so it warrants mentioning that the movie mostly delivers your Star Wars goods, too. The movie is bookended by truly astonishing battle sequences, scenes that harken back to scenes we’ve seen before but keep upending our expectations. Johnson makes sure to keep you on your toes but doesn’t forget to knock you off them. (We also have a few old friends popping up that you might not have expected.) There are moments in the middle that can sometime drag a bit with exposition; the movie has a lot of masters to serve, running about 20 minutes longer than The Force Awakens. Of the three simultaneous plots, it’s Finn’s that sometimes drags down the energy, particularly with an introduction of a shady thief played by Benicio del Toro, the only new addition to the cast that doesn’t quite work; he seems to be acting in his own private movie, and it’s not as good as this one. But even that plotline ties up with a moment of impressive power. (And features an interlude that’s almost certainly the most political statement the series has ever made.) The movie never takes its eye off the ball. It is precisely, and strictly, focused. 5. In a way, the success J.J. Abrams had with The Force Awakens, particularly how decidedly fan-servicey it was, laid the groundwork for what The Last Jedi is able to pull off. That movie reminded you how much power and primal force this series still had. This movie is an even more impressive magic trick: It uses that power and force to connect you to something larger, to tear the whole series down so that it can be rebuilt again. 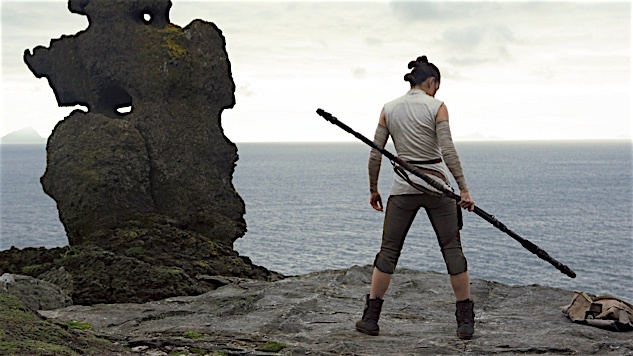 Not everything in The Last Jedi works perfectly, but even its few missteps are all founded in the desire for something new, to take risks, to push an American myth into uncomfortable new directions. It ends up coming through stronger. The Last Jedi is sturdy, formidable, thick with ideas and uncompromising in their execution. And it ends on a note of grace and, yeah, hope, with what might be the best closing shot the series has ever seen. The Last Jedi wraps its way around your heart through your brain: It burns down the past and opens up the future in unprecedented ways. It’s a damned near miracle.